If you are considering a divorce or separation from your partner, Shortlands family lawyers are trained in achieving the best result quickly and with as little confrontation as possible. We work with you to identify the fact that you need to rely upon and apply only those terms that work best for you. One of the main challenges you may face is getting your partner to agree to the divorce and the reasons stated. Our experts follow the family law protocol as cited by Resolution to ensure that agreement is reached at the outset to avoid escalated costs, delay and stress. If an agreement is impossible then we ensure that your case is presented before the court in the strongest terms to avoid complications and early settlement. How long do I have to be married before I can start a divorce? You have to be married for at least one year before divorce can be commenced. Do I have to divorce in the country where the marriage took place? No. You are able to divorce in the UK as long as you or your spouse have been resident here for at least one year before starting your case, or you and your spouse are domiciled in the UK. If my spouse and I have been separated for two years, are we automatically divorced? 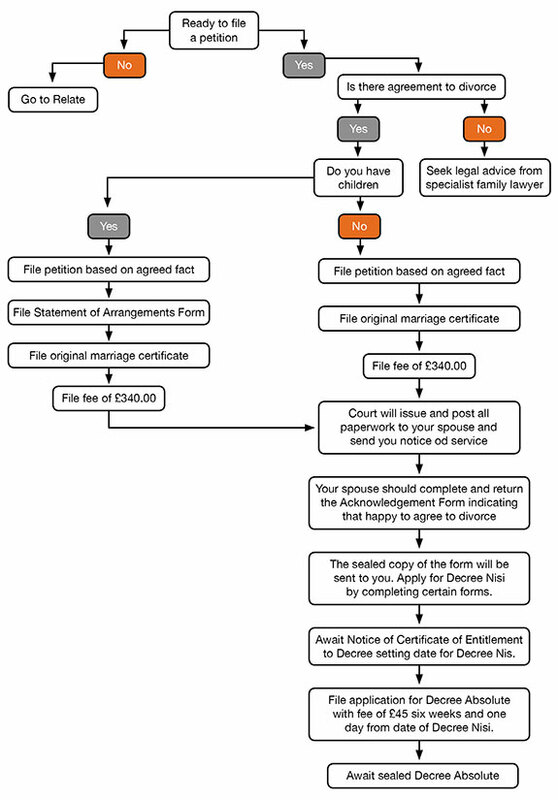 What paperwork do I need to start a divorce? How long does it take to divorce? What happens if I cannot find my spouse? You are still able to divorce by showing the court that you have made attempts to locate them. The facts of 2 years’ separation with consent or adultery should not be relied upon in this instance.